My wife got mad at me for not telling her about the last Coach deal that I posted. She didn’t discover the sale until it was over. Luckily for her (and bad for my wallet), here’s another Coach sale. Click here to print the Coach coupon. 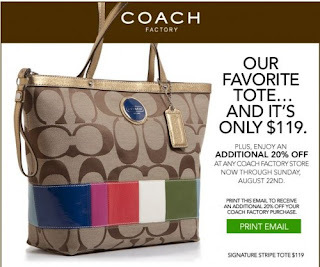 It features their popular Tote bag on sale for $119 plus enjoy an additional 20% Off at any Coach Factory Store now through Sunday, August 22, 2010. You must print this coupon to get an additional 20% Off your next purchase.